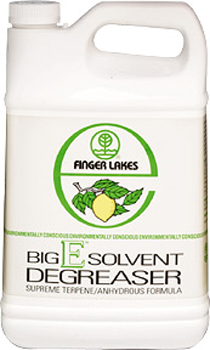 Finger Lakes Big E™ is a pure solvent with a rinse agent added for optimum results. A maximum strength organic cleaner / degreaser for the really tough grease, Big E™ is also effective in removing tar, glue, resins, and coatings. It is an excellent degreaser in lift stations where degreasers must float on the surface. Big E™ is an ideal replacement for many chlorinated solvents. 1. Parts can be sprayed, dipped, immersed, or wiped. 2. Be sure parts washer, dip tank, or sprayer is compatible with Terpene Hydrocarbons.